I recently spent the morning chatting with Chris Barnardo, Director of the Wand Company. I have to be honest, a chat with Chris is a bit like having a conversation with Willie Wonka. This guy is just a creative genius, with a childlike glee for product design, and just enough giddiness about him to be infectious. Chris has a way of sucking you into his passion and joy for the product he designs. By the end of our conversation, all I wanted to do was go out and collect every item he has created. The Pick-R-Up is just a die-cast car, right? Not exactly. I mean, I've got a bunch of die-casts hanging around my house. But then none of those diecast models come with packaging that feels just as collectible as the car itself. They also didn't come with a driver's manual, certificate of ownership and a sweet pin. Those are just some of the fringe benefits of owning a collectible created by The Wand Company. With most collectible products, receiving the item is the end of the collectible experience. You get it, you throw it on a shelf, and you're done. The Pick-R-Up truck, and other items, from the Wand Company, introduce the notion that receiving your product is just the beginning of the ownership experience. Chris has a design philosophy that bucks the standard design and development process. Rather than trying to develop a product from the beginning and then stopping the development process once they sell the item - The Wand Company takes a unique perspective and starts the design process 2 months after you have owned it. This design process requires them to think about how the product is going to engage you long after you purchase it. They think about what you can discover, what you can find out about the item, and what your experience will be after you have owned it. With the insights found in their post-purchase exploration, they backfill the interesting bits of the product design. This is a fundamental shift in thinking, where they think about the ownership experience rather than the purchasing experience. It's with this unconventional thinking that Chris dreams up ideas like having hidden areas in his products, easter eggs, and inside gags that most owners may never find or experience. The ultimate goal is to have the owner fall in love with their item each and every day that they own it. This design philosophy came to bear when we were talking about the engine for the Pick-R-Up truck. The engine really isn't shown in any kind of detail in the game, so Chris wanted to come up with a design that felt like it was in-line with the theme of the game. So, what better idea, than to dream up a nuclear-powered engine for the car? At one of my previous jobs, I would have severe design restrictions to work within for product design. The product has to weight less than 3 pounds, be smaller than 12" in any direction, and cost less than $10 to manufacture. Ugh! These types of design constraints are common in the design world. Chris casts that all aside when he starts a design. For the vehicles that were developed for Fallout, he didn't start with the question of "what could the market bear?" Rather he started with the notion - how do the vehicles fit into the world...and how would the fan want to deal with them in the real world? Chris always prefers to do lifesize replicas of in-game items. Needless to say, that wasn't going to be practical for a car. After lots of brainstorming, he hit upon the notion of the vehicles being scale models that the car manufacturers would give to their employees for 10 years of service. The idea that you might be able to wander through the world and find these items on shelves in the houses of ex-employees fascinated him, and became the lynchpin for all of the product development. It is also this melding of in-game and out-of-game experiences that drive much of his design philosophy. It is part of the reason that you will find a "driver's manual" included with your vehicle that shows figures that are scaled accurately to the vehicle, but also shows mechanics that are wielding pie plate size batteries in the illustrations. The design team is always breaking down the walls of what is and what could be. The design process is always one of iteration, but rather than design a product based on the minimum requirements to be successful in the market, The Wand Company likes to create the ultimate expression and value proposition of the product and then let reality seep into their thoughts in a way that makes the item affordable and yet very cool. Chris would prefer to find ways to make production more cost effective than removing a product feature to save a few pennies in development. It is that attention to the details of the product and the ownership experience that garner his products so much praise. 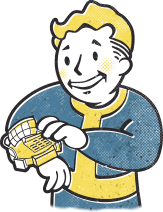 The Bethesda Gear store will be bringing the Pick-R-Up truck to the store on Thursday, February 21nd, 2019 at 8 am MST. We will release both a limited and open-edition version of the truck. Quantities on the Limited-edition version are EXTREMELY LIMITED. Do not miss your chance to own this stellar vehicle replica.